Cognitive-behavioral coaching is currently the most evidence-based approach to coaching, in the same way that CBT is the golden standard approach in psychotherapy. This webinar of two hours will maintain the format with two sections: a free discussion section and a live demo session. First section will consist of the discussion between speakers focused on developmental RE-CBC and its application to organizations. Rational principles that can guide organizations towards performance and productivity are going to be discussed. Also, the concept of rational leadership together with underlying attitudes and competencies will be discussed. The demo session will use a developmental approach for addressing with a work related goal in RE-CBC. Dr. Dominic DiMattia will demonstrate the process of RE-CBC in this case and speakers will debrief afterwards on the techniques used. This webinar is part of the online certification program. See details here. Dr. Dominic DiMATTIA is currently Professor Emeritus of Counseling and Human Resources at the University of Bridgeport and a Human Relations Consultant. He was previously Executive Director and Senior Staff Supervisor at the Albert Ellis Institute, vice-president of Human Resources for the Fireman Group in New York. 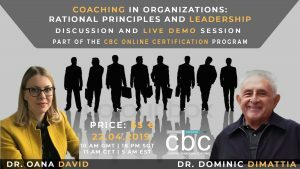 Dr. DiMattia has authored first books on RE-CBC, written numerous journal articles, and conducted many workshops and seminars in life coaching and corporate coaching, based on the cognitive-behavior theory. This webinar is addressed to our members and any student or professional around the world interested in this field.